Your dog sits patiently underneath their leash sitting on the counter. Patient at first, with tail wagging, they look expectantly at you and then back at the leash. Over and over again they do this until they realize that you’re not budging. A walk isn’t going to be happening today. Their tail slowly stops moving, they lay down, and give look up at you with those all too well-known and heartbreaking puppy eyes. How could you be so mean? At Eastside Animal Hospital in Muskogee, we know that certain days a walk just isn’t possible — whether this be due to the weather outside, you’re not feeling well, you’re waiting for the cable guy and can’t afford to miss them when they ring the door, what have you. Sometimes you can’t take them out. However, they don’t fully understand why this is and it’s not like you can explain it. In their mind, they’re wondering why they’re being punished and not able to go out and run and smell everything in their path. 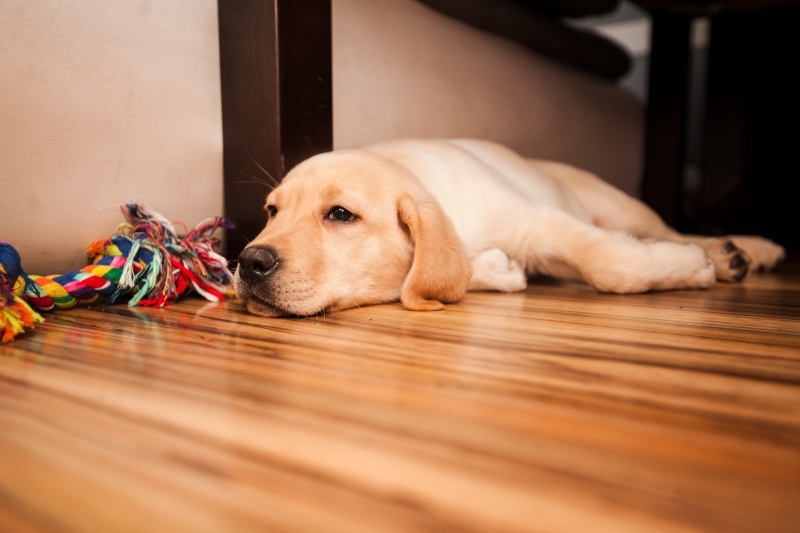 Don’t worry, in this post, we’re going to be providing you with several things that you can do indoors with your furry best friend to keep them active and knowing that you love them with all of your heart, just like always. If you would like any more tips and advice or would like to schedule an appointment for one of the many veterinary services that we provide, then go ahead and contact our animal clinic today! No matter what you (or more fittingly your dog) needs, you can count on us! From general veterinary health exams, dental care, nutritional advice, our dedicated staff is here for you, rain or shine! This might as well be called search and sniff, but either way, it will keep you and your doggo entertained. It might be a little difficult for you to play it the traditional way by hiding yourself and having them find you since your pet is probably going to stay by your side, or if they don’t, find you almost immediately with their incredible sense of smell. So instead, grab some treats and let them smell (if they’re a really good boy/girl then maybe let them have one at the start), then go to a room where they can’t see you and hide them in sneaky spots around the space. You can make it easy for them, or really give them a challenge. Either way, you’re dog will be spending quality time with their human, as well as getting to be able to find some treats. Two of their favorite things! If your dog is a big fan of fetch, it doesn’t matter whether they’re retrieving in a field or down the hallway. 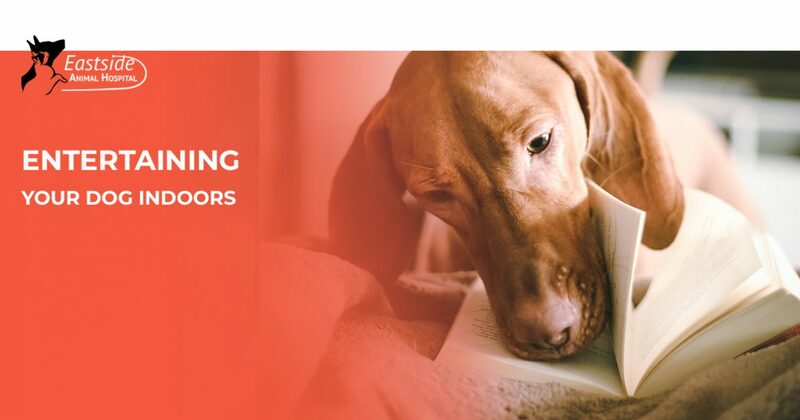 Sure, they won’t be getting as much exercise as they would be compared to playing outside, but we guarantee that their tail will be wagging frantically and they’ll forget that you’re not outside. If you have stairways, utilize them (if your dog is in good enough shape) and have them run up and down the steps chasing the ball. This will get at least some of their pent up energy out. Ah yes, the classic. Since man and dog became best friends, the game of tug-o-war has been a go-to game to play to test each other’s strength and have a blast doing it. Don’t forget this when the weather is stormy out and you’re unable to take a walk. Not only will they love trying to show you that they are stronger than you are and come out on top with the rope or toy, but it will have them using their muscles. Just be careful not to pull too hard and risk damaging one of their teeth! If this does happen, come on into our animal hospital for some dental care and we’ll see what we can do! Some may say that you can’t teach an old dog new tricks, but this is a fallacy. No matter the age of your four-legged friend, they can still learn new things. If they struggle with learning the tricks, that’s a-okay! Mental exercises are just as important to your dog’s health as physical exercises, so although they are not getting their walk in, you can be happy that you’re helping to improve their overall well-being. If your pup isn’t able to pick up the tricks, that’s completely fine! They’ll love your attention, and will probably find you pretty hilarious as you try and show them something that they don’t understand. For some ideas on tricks, click here. Aside from your affection, all your dog is really asking for is to be entertained. If this is one of your sick days that inhibits you from taking them out, or you’re busy working at home, then puzzle toys are a great way to keep them busy and not thinking about the great outdoors. These hide treats or peanut butter in areas that prevent them from scarfing it down. You can rest assured that all of their attention will be focused on getting to that sweet treat hidden inside. Kong toys are a great option for this but there is a variety on the market. If you would like some recommendations simply as your veterinarian at Eastside Animal Hospital! 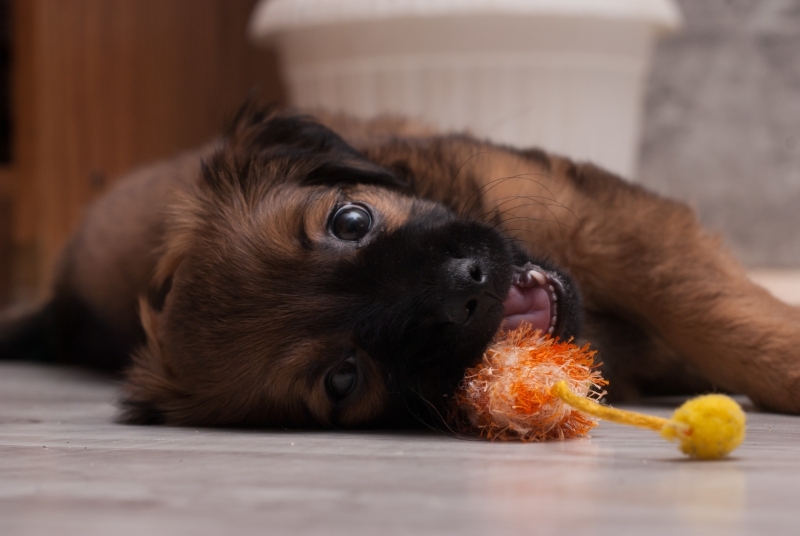 Our staff has seen all kinds of dog toys and will be able to suggest a few of their favorites. This one might be more fun for you than your dog, but it’s a great thing to do when bored! Simply grab three cups and one of their favorite treats. Let them sniff the treat to get them excited, then let them watch you place it under one of the cups. Next, swirl the cups around like a madman! Back and forth, to and fro, rotating them around so that your dog loses sight of the cup that has their sweet reward. Line up the cups, and let your pet try and figure out which one holds the goods. They’ll likely put their nose on one, following this, reveal what’s beneath! If it’s the treat, they’ll be happier than ever. If not, simply do it again! This is a great way to pass time and get a few laughs in as well. The thing that veterinarians, and your dog, recommend most is providing your pal with as much love and affection as possible. Although you might not be able to take them on a walk or to the dog park, all they really want to know is that you care about them, because you can bet that you’re their entire world! If you’re feeling under the weather, or just can’t take the time to play games at the moment, give them some much-deserved belly rubs or scratches behind the ears. They’ll forget about the outside while they get pet from their best friend. At Eastside Animal Hospital in Muskogee, we know how much your dog means to you and how much you care about them, and we do too! Our entire staff is dedicated to the health and well-being of each pet that we treat and do everything in our power to make sure that they are living their happiest life. If your dog is in need of our veterinary services, then don’t hesitate to make an appointment with one of our veterinarians. In the meantime, go have some fun with them! Indoors or out.